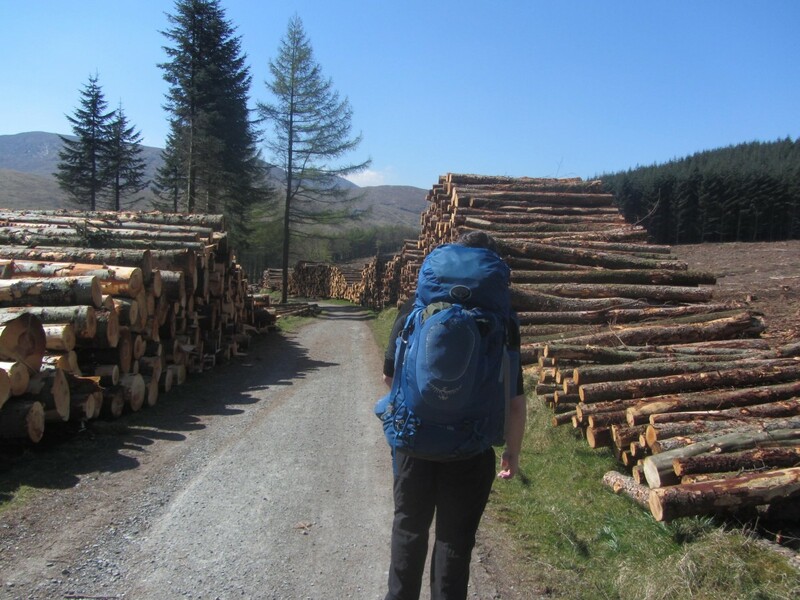 THE AIR WAS HEAVILY SCENTED WITH THE ODOUR OF WOOD SAP AS WE RAMBLED ALONG THROUGH THE NOW FAMILIAR TOLLYMORE PATH, ALL AROUND US TIMBER HAD BEEN FALLEN, TRIMMED AND STACKED NEATLY READY TO BE TRANSPORTED TO AWAIT ITS FINAL USE. Nearing the end of April we had been rewarded with a high-pressure system of weather and the oppourtunity to camp was just too tempting to ignore. Ed and I quickly drew up our battle plans and finally settled on a summit camp on Slieve Corragh. I’ve often passed over Slieve Corragh, a somewhat featureless mountain except for a few granite rock formations at the Corragh/Commedagh col but what it lacks in features it more that makes up for in commanding majestic views over the Mourne range. The first part of our journey brought us along the familiar forest paths of Tollymore which has recently had some quite dense tree falling.” the air was heavy to the odor of wood sap as we rambled along through the now familiar Tollymore path, all around us timber had been fallen, trimmed and stacked neatly ready to be transported to await its final use. As we left Tollymore forest the now blazing suns heat could be felt with full force so we stopped along the bubbling Spinkwee River to fill our bladder packs and apply sunscreen. The terrain underfoot was a strange mixture of sodden marsh or brittle dry heath land. The ascend itself on Corrgh was gentle enough but in the heat of the day we took our time and admired the views back over Tollymore and the demise of county down. Reaching the Mourne wall we knew the main ascent was done so we sheltered from the sun under the protection of the wall. After a short trek we found ourselves on Slieve Corragh. A summit overlooking Ben Crom reserve and a vast array of Mountains on all side. 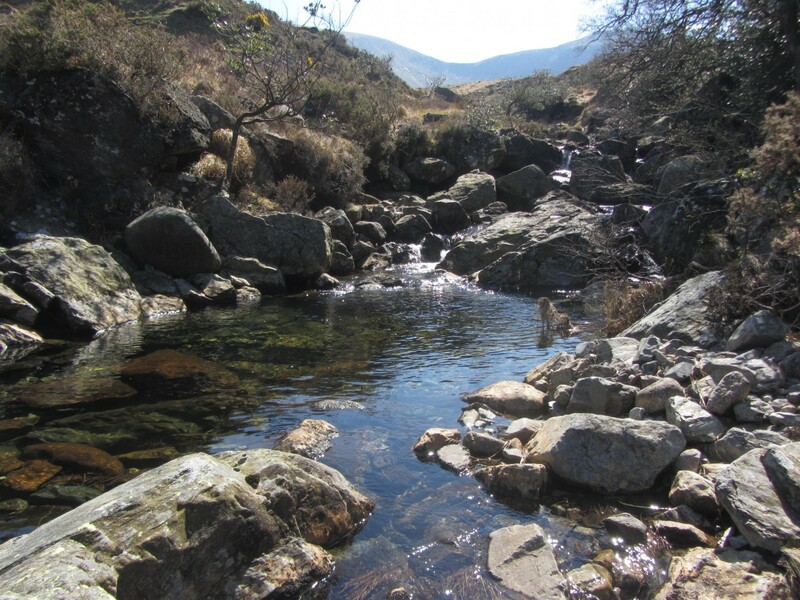 We quickly pitched camp and Ed went to fetch water from the natural spring on Slieve commedagh lower slope. That evening we relaxed watching the setting sun and the vast colors it provided in the night sky. Eamonn had ventured up for a walk with his dog and had kindly brought a few provisions to help keep us going. Not long after 11pm we retired for the night. I awoke first as usual around 5.30 am and set about making a brew and watching the sunrise. Even as early as 8am the heat of the sun could be felt as we watched the mountains bathe in the light it provided. We were in no rush to break camp so we sat around listening to music and enjoying lunch and hot coffee. Around midday we finally left our pitch and descended towards the Brandy pad, an old smugglers path that leads over the mountains. 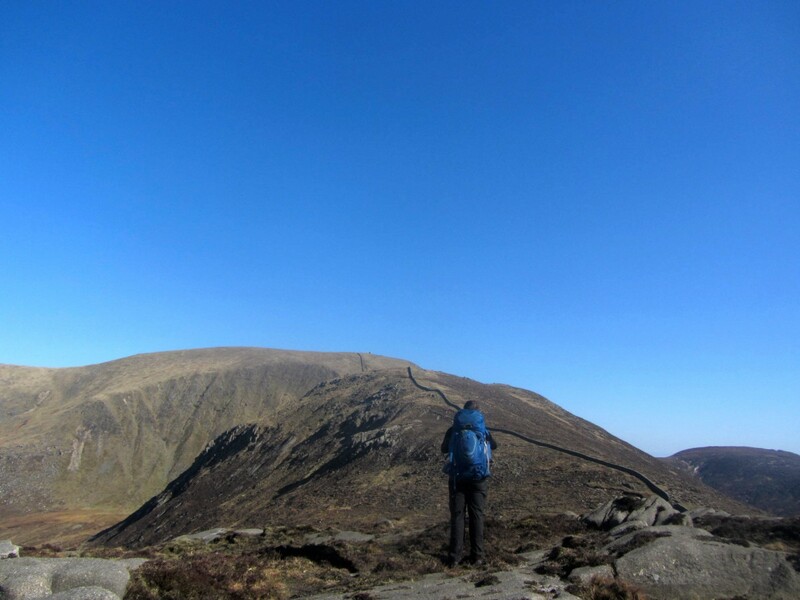 Reaching the Donard,Commedagh col or the Saddle as its communally known we paused again to have some lunch. The descend from the Saddle to the valley floor is quite steep but a good path helps ease the burden of foot placement. It was now around 3pm and the full force of the sun’s heat could be felt on the backs of our necks. We finally reached Newcastle around 4pm were we caught the bus home. 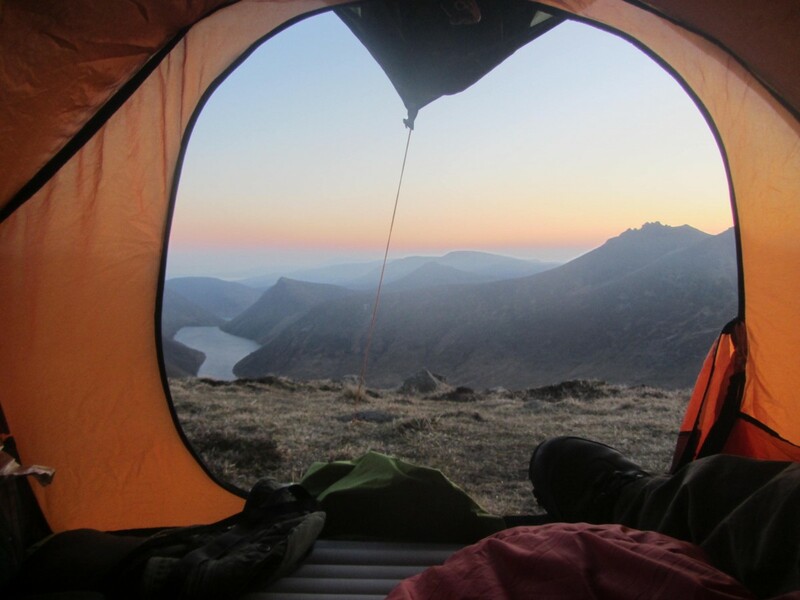 As campers, hikers we often have to put up we poor weather, days of rain, wind and hail, but not this time. We had summit camped on one on one of the finest days I can remember on one of the best spots I’ve ever camped.